Children are like sponges – they soak up a lot of whatever is around them. Put a kid into a grey, empty room, and they won’t have much to soak up. But if you put them into a room filled with opportunities for learning and fun, interactive tools, they are going to soak up a whole lot. 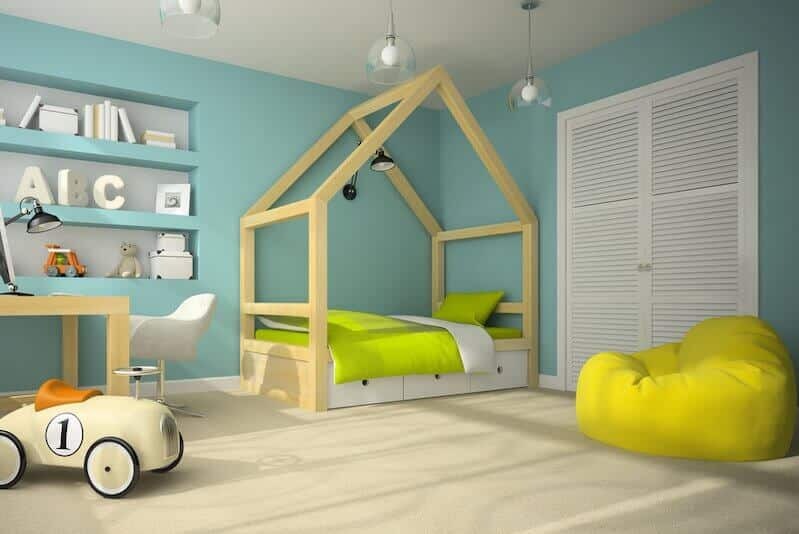 Use these kid’s room design tips to create a bedroom that isn’t just a great place to sleep – but also somewhere to learn. What’s the first thing that comes to mind when you think of kids and walls? It’s a marker pen making nonsense drawings on your pristine white paint or wallpaper, right? Since this is a natural process that kids are bound to go through, you might as well harness it. Interactive walls come in many different shapes and types. Wipe-off paint is a great example: it has been specially formulated so that it’s easy to wipe off marker pen after your kids have had their fun. You can also use movable decals to help them tell stories on the wall or even whiteboards with special pens. Having that space on the wall will allow you to challenge them – can they count to five? Write a word? Draw a lion? When it comes to furniture, think comfort. Kids like soft textures and comfortable places to sit, lie, or stand. While an office chair might be suitable for an adult, it’s not what you would want at your kid’s desk! 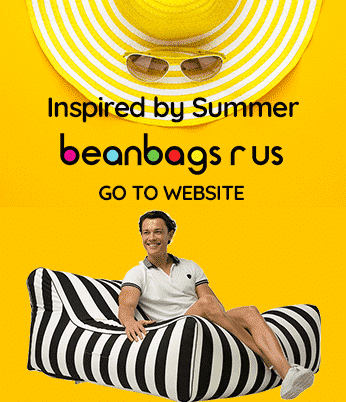 Try using bean bags as an alternative chair that your kids will love. They are comfortable, easy to move around, and have a huge element of fun. In fact, your kids might sit down in front of a desk or learning area just because they want to sit in the bean bag. Getting them into this fun seat will help to encourage some learning activities. They aren’t just suitable for bedrooms, but for playrooms too – and even classrooms. As a major supplier of bean bag chairs to education departments throughout Australia, we should know! We manufacture beanbag chairs designed especially for schools. The soft and squishy texture can help with sensory learning from an early age, and as a parent, you will appreciate the fact that they are easy to clean. When your child’s body is comfy and settled, their mind will be free to learn. Start a habit with a design. Research suggests that we are creatures of habit. When we form a habit early, it’s especially difficult to break. That’s why helping your kids develop good habits now will make a difference. Create a unique learning area with a desk and bean bag in your kid’s room design. The desk should hold all of their learning equipment and tools and will have space for them to write or draw. Even if they aren’t yet at school, get them into the habit of sitting down at this desk to learn, create, and have fun. This “homework” will prepare them for the real schoolwork that comes later or help them to develop faster if they are already in education. You never want your child to miss a learning opportunity just because they didn’t have the right tools on hand. Stock their desk with different types of pens and pencils, rulers, erasers, paper and cards. Put some essential books out that everyone will always need – a dictionary and thesaurus, for example. Glue and scissors can be provided for older kids. If you’re low on storage space, you can buy or make holders which will hang on the wall and provide a space for whatever they need. If you have two (or more) children, and especially if they are close in age, you know how much they can distract one another. Solve this problem by putting two desks on opposite sides of the room so they will always have their backs to one another while they are studying. This will help them to focus more and will put them into their own little study zones. It also means they can have their own supplies, with no arguments over who used what last! Kids love to play. When learning is fun, they can be tricked into not realising that they are learning. That’s why it’s a great idea to put items into their toy box that will help them to learn, even when you are not watching them. When thinking about what to buy them for their gifts, or advising family members on what they will want, try to go in an educational direction. This doesn’t mean that the toys have to be boring – there are plenty of fun educational toys out there! Promote learning and creativity with the use of bright colours. Just like you would let them have their favourite Captain America or unicorn duvet covers to make the bedroom feel more inviting, you can use bright colours on the walls and furniture to make kid’s room designs more exciting. You can even try to use all of the colours of the rainbow to help with another educational tool – ask them to recite the colours of the rainbow by touching something in their bedroom with the right colour in order! Flashcards are a great learning tool. They have been proven to help improve memory while studying. You can put flashcards up directly on the walls if you can do it without damaging them. Otherwise, you could buy a metal board with some magnets to attach them to! You and your child can create flashcards together as they grow. You may start with simple colours and numbers – and one day, help them revise for their last school exams with Shakespeare quotes and scientific equations. Designing a bright, colourful, and tool-filled bedroom for your kids will help to ensure that they develop the habit of learning. This habit will help them for the rest of their lives. Anyone with a love of learning is guaranteed to go far!